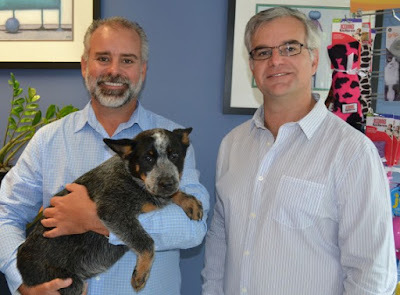 The VetShopGroup portfolio of businesses is growing after the acquisition of VetProductsDirect.com.au, LoveMyPet.com.au, OurPetPharmacy.com.au and MyPetSolutions.com.au announced by Veterinary Entrepreneur and Internet Pioneer, Dr Mark Perissinotto BVSc. This merger cements the company's position as the number one veterinary owned online retailer of pet health products in Australia. “We’re delighted to bring on board the Vet Products Direct business” said Dr Mark today. “We feel that it’s important for Australian pet owners to be able to source affordable pet medications, premium pet foods and other pet supplies from a company that is owned and operated by veterinary health professionals. With this acquisition, we’re substantially increasing the number of vet nurses and animal health professionals on our team, so our customers will always know that they are getting the best advice and the best products available not simply shopping from ‘just another pet shop’“. Dr Mark also confirmed that the acquisition, which effectively doubles turnover, will give the group increased buying power, operational efficiencies and savings. “It’s our intention to pass those savings on to our customers as quickly as possible” Dr Mark said. “Pets are much loved members of the family, but unfortunately the cost of regular flea, worm and tick control, food and other medications and supplies can add up. We hope we can help a little by reducing those costs”. It’s not just about costs though, and Dr Mark and his brother Steven have built a thriving business focused on outstanding customer service. The VetShopGroup identified Vet Products Direct’s strong focus on vet nurse lead customer service and large loyal customer base as key reasons for the acquisition. Established by Dr Michael Shaw and Dr Mike Woodrow just a few months after VetShopAustralia, Vet Products Direct held the number two position in Australia and is well known for its team of helpful vets and vet vet nurses. The group will continue to operate the various websites separately as each offer a different shopping experience focusing on different demographic groups. However the focus on back office and logistical integration and synergies is intended to deliver even better customer service and delivery, a greater range of products and better prices for all customers of all the group’s websites. The acquisition also gives Vet Products Direct customers priority access to PetScripts.com.au, which allows Australian pet owners to buy discount prescription pet medications online (*veterinary script required). Dr Mark and his brother Steven lead the online pet health revolution in Australia, launching the first pet online retailer in 1999. Since then the group has grown to be the largest and most awarded online retailer of pet health products in Australia. Their flagship website in Australia is VetShopAustralia.com.au. In 2015 they acquired veterinary owned DrCarl.com.au and PetCareShop.com.au, in 2017 they launched PetScripts.com.au. VetShopAustralia.com.au is also world famous for its Surfing Dog Spectacular (www.surfingdogspectacular.com.au) held in Noosa each March.